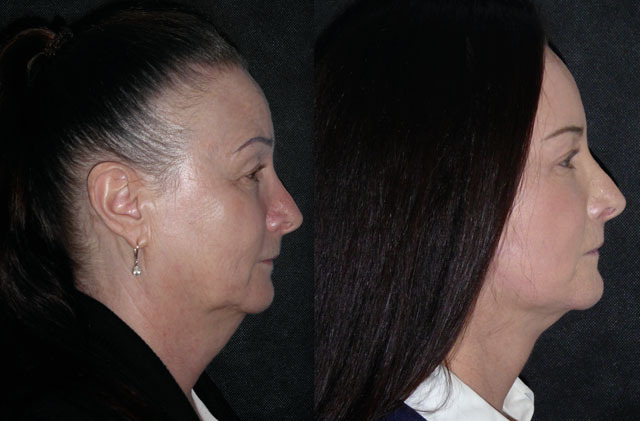 Anne had previously undergone upper eyelid surgery and rhinoplasty when she came to consult me about her neck and jawline. She has attractive small features in her mid and upper facial thirds but the lower face and neck was dominant and overshadowed these. 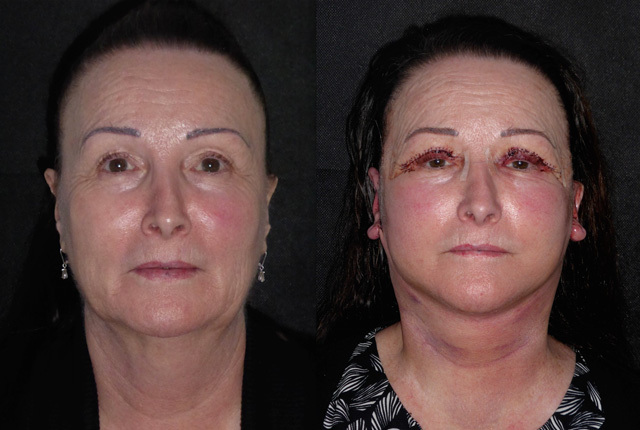 We undertook a face and neck lift, revision upper blepharoplasty, platysmaplasty and submental liposuction and subplatysmal lipectomy. All under local anaesthetic and sedation. 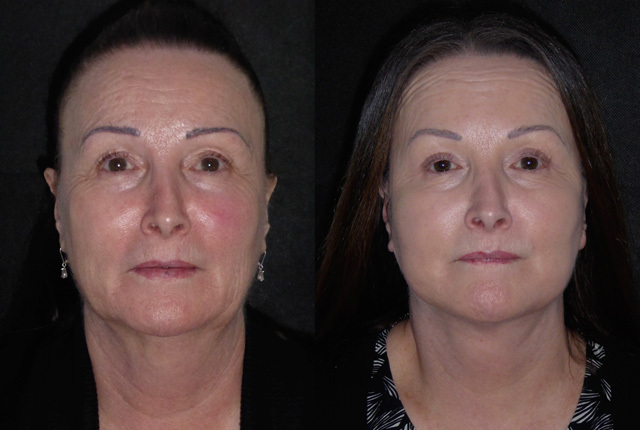 It still amazes me how ‘well’ my patients look the morning after significant facial plastic surgery. In my opinion, the horror story pictures of drains, black eyes and swelling really should be confined to the 1980’s! Anne is doing great on very little sleep. After her hair is washed we can already get a glimpse of how her jawline and necklines have been recovered and resculpted. She is swollen - naturally - but should do really well. Anne is back for removal of her stitches and looking lovely. Not a bruise on her face! 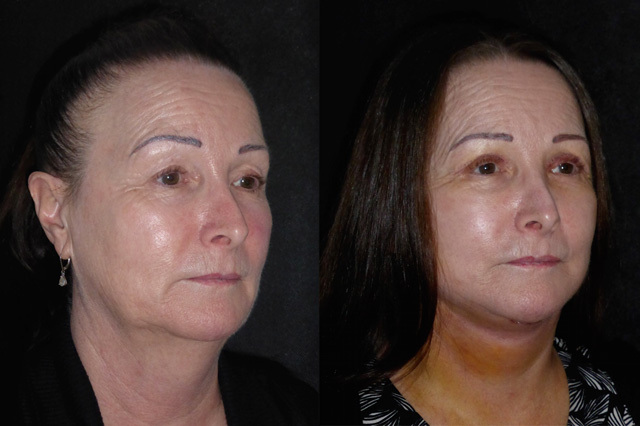 The neck is obviously bruised but then she did have a lot of work to refine her neckline and vigorous liposuction. Now the bruising is yellow it will only be a few days before it has gone. 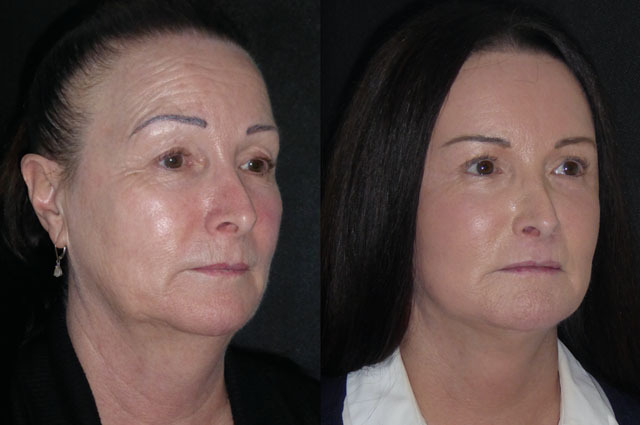 Her eyes are more open following her revision upper blepharoplasty and her face shape has transformed from an ageing rectangle to a youthful oval. Anne is such a kind and modest lady, she looks really refreshed but doesn’t want to look at her photos in clinic. I am so grateful to her for letting me share her photos on the gallery. Anne is back to London for review and looking stunning. Such a cute face shape that befits her small features. 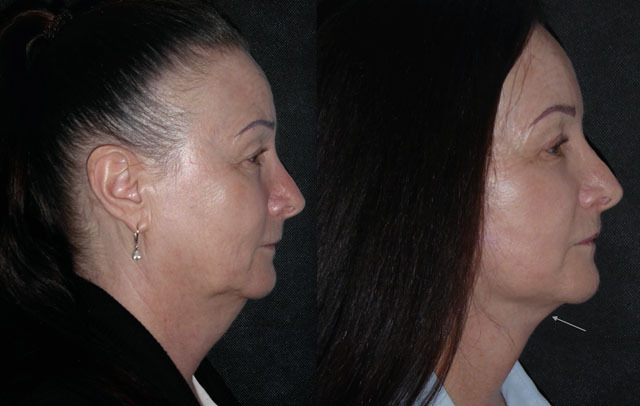 Her eyes are open and refreshed, her mid face is nice and voluminous and her jaw and neck lines are defined. I am really proud of Anne’s result! I’ll let you into a secret here. 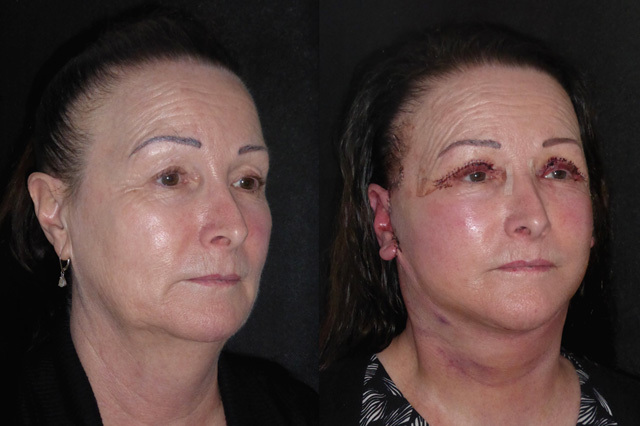 I think I may be my own worst critic, despite uniquely performing facelift surgery and over 50% of those cases being revision of others work, I am yet to be 100% happy with any procedure I have done - there is always room for learning and improving. Subtle refinements in technique and position make a huge difference in the face. The day I refer to myself as an expert is the day complacency has set in, when that happens focus is lost and results suffer. 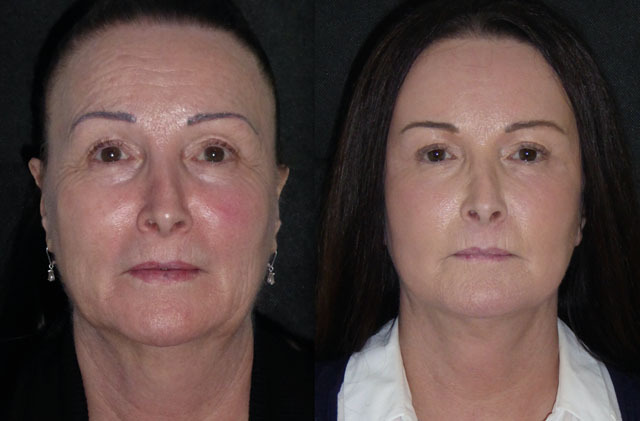 I am acutely aware that I am only as good as the last facelift I have performed which fuels my hunger to refine, innovate and improve my results. These photos are 6 months post op but also preop. 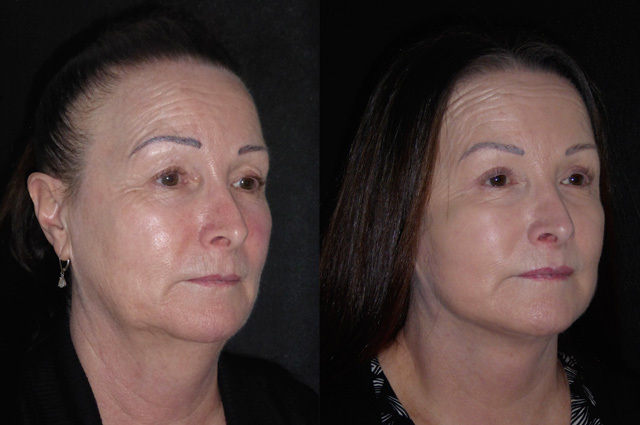 Today I am lifting Anne’s lateral brow and performing full face C02 laser resurfacing. Anne looks great. 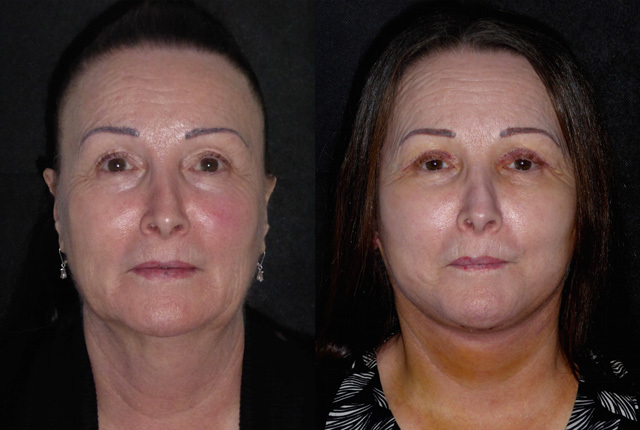 Her jowls have gone and her neckline is much improved and holding well. 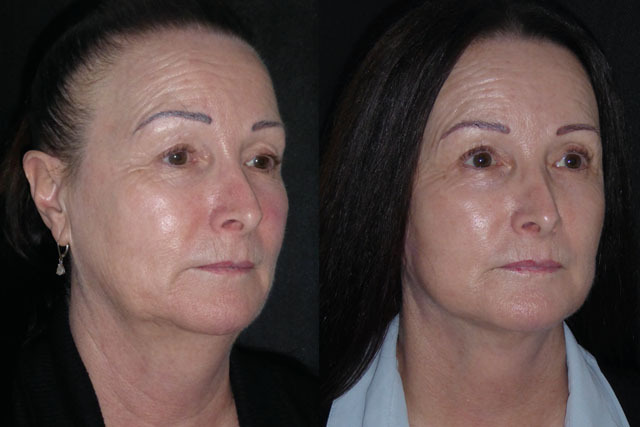 I use this gallery a little like a blog to discuss various concepts around facial rejuvenation surgery which I hope will be helpful for anyone considering facelift surgery anywhere in the world. On Anne’s profile shot I have marked the position of her hyoid bone. 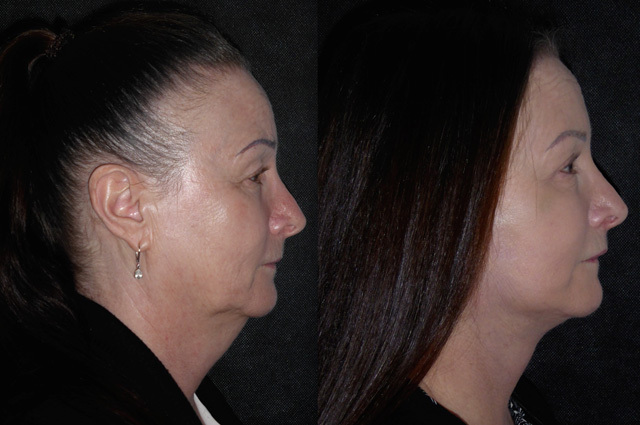 This is a small horseshoe shaped bone above the voice box, the position of which is really important in neck lifting. A low hyoid bone (as in Anne’s case) means the chin-neck angle achievable is limited by the underlying voice box cartilage. 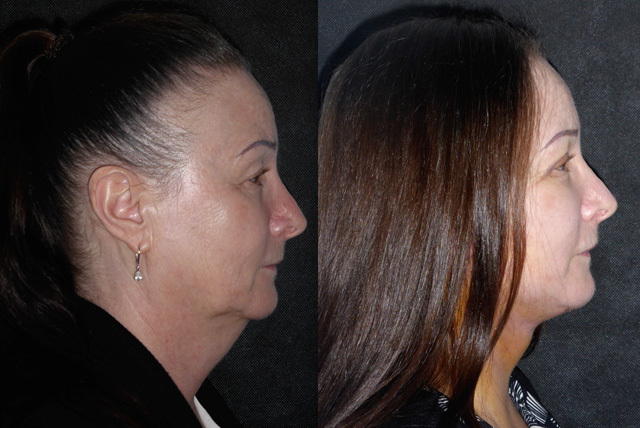 Anne has a lovely result but her pics are ideal to show that the super defined neckline that some wish for might not be possible. These photos are 10 days after the 6 month ones above. 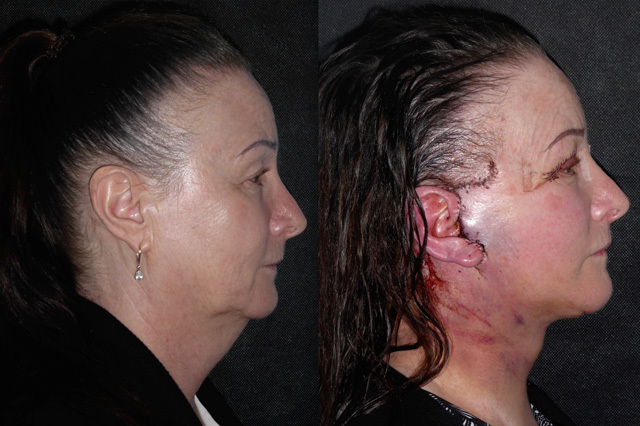 Anne has had a swollen and scabby week as her facial skin has peeled and healed. Her fresher complexion is obvious even at this early stage but the healing will take months to complete. Her skin tone is more homogenous, her fine lines have improved. 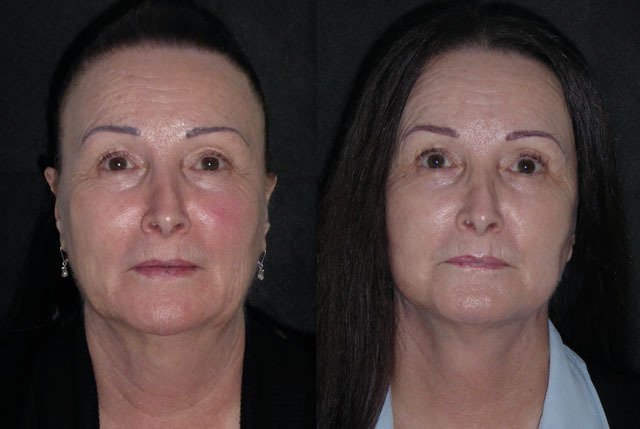 Her brow shape has improved with elevation of the lateral third although the nerves to her brow elevator muscles are a little sleepy but recovering hence the lower brow position.